Lonny Magazine, June/July, 2010, DamGoodSweet is featured among editor Ellie Somerville's six kitchen resources. SERIOUSEATS.COM, May 3, 2010 Meet & Eat editor, Caroline Russock, chatted with chef David Guas on the inspiration behind his James Beard award nominated dessert cookbook DamGoodSweet. Guas also shared one of his favorite summer desserts from the book, his Lemon Icebox Pie. O, THE OPRAH MAGAZINE, May 2010 David Guas was selected among America's most brilliant bakers to create a delectable dessert for O's tenth anniversary. Inspired by DamGoodSweet, Guas created the spiced Gateau de Bayou showcasing the flavors of his native Louisiana. WASHINGTON POST, February 10, 2010 David Guas discusses the history and traditions of New Orleans style snoballs in Desserts that Fall from the Sky, a snowstorm themed dessert article. LOTTIE + DOOF BLOG, February 10, 2010 With the arrival of Mardi Gras season, blogger Tim Mazurek recreated David Guas's King Cake from DamGoodSweet. Mazurek blogged that DamGoodSweet is a fantastic book both in terms of recipe quality and writing. THRILLIST DC, February 4, 2010 David Guas Honey Nut Crackle recipe is featured in a roundup of the top Super Bowl snacks to make at home. NOLA.com, February 1, 2010 Judy Walker featured the DamGoodSweet recipe for Heavenly Hash on the Times-Picayune website. WASHINGTON POST, January 27, 2010 In Real Entertaining: Turning Leftovers Into Party Food, David Hagedorn uses leftover holiday brioche and croissants to create David Guas's Chocolate Bread Pudding recipe from DamGoodSweet. FOOD AND WINE MAGAZINE [online], January 24, 2010 David Guas's Lemon Icebox Pie from DamGoodSweet is featured in a slideshow of Gail Simmon's Favorite Desserts. EPICURIOUS MAGAZINE [online], January 8, 2010Epicurious.com featured five recipes from DamGoodSweet including Guas's Buttermilk Beignets, Chocolate Cupped Cakes with Coffee and Chicory, Banana Pudding, Lemon Icebox Pie, and Calas Fried Rice Fritters in New Orleans Sweets. MARTHA STEWART LIVING SIRIUS SATELLITE RADIO SHOW, January 6, 2010 David Guas shared recipes from DamGoodSweet to celebrate the start of Mardi Gras and King Cake season. AOL's SLASHFOOD.COM, December 30, 2009 The editors of AOL Food spent the year reading and feasting their way through numerous new cookbooks and selected DamGoodSweet as one of thirteen of the Best Cookbooks of 2009. L.A. WEEKLY, December 21, 2009 DamGoodSweet was included in the Best Baking and Pastry Books of 2009 roundup. AOL's SLASHFOOD.COM, December 3, 2009DamGoodSweet is featured as one of Slashfood's favorite baking books of the year. DamGoodSweet separates itself from other baking cookbooks by bringing back the importance of preserving and passing down recipes and memories, making it a cookbook worth buying. PHILADELPHIA INQUIRER, December 17, 2009 David Guas and his recipe for Buttermilk Beignets from DamGoodSweet are showcased in the Christmas confectioner's sugar story. WASHINGTON POST, December 16, 2009DamGoodSweet is featured in a roundup of the year's best baking books in the Cooks Who Entertain category. The Post reported that David Guas had us at Lemon Icebox Cake. ORANGETTE BLOG, December 13, 2009 Molly Wizenberg raves about David Guas Caramel Popcorn, telling the full story of how she first met David and tasted his amazing popcorn. Wizenberg introduces her blog readers to DamGoodSweet and includes Guas's recipe for the crunchy treat. DELTA SKY MAGAZINE BLOG, December 4, 2009 Jason Oliver Nixon included DamGoodSweet as a gift-worthy cookbook for the holidays. A TIMES-PICAYUNE, December 3, 2009 Chef David Guas and his new cookbook DamGoodSweet are featured on the cover of the Times-Picayune food section as a must-read book for New Orleans cooks and home chefs nationwide. WHERE MAGAZINE, December 2009 DamGoodSweet is featured as an ode to sugary Southern classics in a roundup of Crescent City cookbooks. LOUISIANA HOMES & GARDENS, December 2009 In Fete de No. l, chef and author David Guas created a French holiday tea with sweets such as gateau de sirop and red velvet cake from his cookbook DamGoodSweet. LOUISIANA COOKIN' MAGAZINE, December 2009 As a must-have for any Louisiana cook, DamGoodSweet and David Guas's Turtles recipes are featured as a great way to give the gift of candy this holiday season. PAULA DEEN'S CHRISTMAS MAGAZINE, December 2009 In this special holiday collector's issue of Cooking with Paula Deen Magazine, the making of DamGoodSweet is explored in Sinfully Sweet, a complete look at David Guas's career and passion for desserts. LEITE'S CULINARIA BLOG, November 30, 2009 This James Beard Award-winning site from David Leite featured the recipe and photographs of David Guas Lemon-Herbsaint Poppers from DamGoodSweet. KNEWS AM 1270 [Palm Springs, CA], November 28, 2009 David Guas's recipes from DamGoodSweet were praised and discussed on air for seven minutes, specifically the Bananas Foster recipe. WASHINGTON POST EXPRESS NIGHT OUT, November 25, 2009 The Express interviews David Guas on the making of DamGoodSweet and suggestions for holiday baking. PBS CHEF'S A FIELD, November 14, 2009 David Guas appeared in an episode titled Disappearing Act: Imagining the World without Bees, sponsored by Haagen-Dazs ice cream. Guas explores and raises awareness for the many farms in the northeast that oversee honey bee colonies that are an integral part of the crop-pollinating process in the U.S. APARTMENT THERAPY'S THEKITCHN.COM, November 19, 2009 TheKitchn.com features DamGoodSweet's Sweet Potato Tart Tatin as a promising dessert to make for Thanksgiving. DAILY CANDY, DC EDITION, November 10, 2009 Daily Candy featured David Guas's Chocolate Cupped Cake recipe from DamGoodSweet listing it as a decadent Southern dessert. SERIOUSEATS.COM, November 9, 2009 Cakespy, Jessie Oleson, showcases her rendition of DamGoodSweet's Sweet Potato Tart Tatin citing it as a delicious dessert to make this holiday season. PUBLISHER'S WEEKLY, November 9, 2009 Featured in the The Year's Best Books About Food David Guas's DamGoodSweet received honorable mention as the Best Virtual Trip to the Big Easy. WASHINGTONIAN MAGAZINE'S BEST BITES BLOG,November 5, 2009 Best Bites features an interview of chef David Guas about how and why he created DamGoodSweet to feature the desserts of New Orleans. FINE COOKING MAGAZINE [online], November 2, 2009David Guas's recipes for Calas Fried Rice Fritters, Banana Pudding and Lemon Icebox Pie from DamGoodSweet are featured on the popular web site. WASHINGTON CITY PAPER'S YOUNG & HUNGRY BLOG, November 2, 2009 Food editor, Tim Carman, profiles chef David Guas's career and new cookbook, DamGoodSweet, listing it as a notable book for New Orleans natives and home chefs everywhere. NEW ORLEANS LIVING MAGAZINE, November 2009 DamGoodSweet is featured in The Latest and Greatest as the one recent book release that has editor Lori Gaudin glued to its pages. ..the Sweet Potato Tart Tatin is, well, all I can tell you is that this is absolutely on the family Thanksgiving menu and reason alone to buy this book. Genius! FOOD & WINE MAGAZINE, November 2009 David Guas's Spiced Upside-Down Apple Bundt Cake is showcased in the Last Bite section of the magazine, complete with a full recipe and close-up image of the DamGoodSweet author's seasonal dessert. SOUTHERN WEDDINGS MAGAZINE, Fall/Winter 2009DamGoodSweet is featured in the 60 Ways to Have a Southern Wedding as a great resource when making your own homemade wedding favors. TASTING TABLE: Everywhere Edition, October 29, 2009 DamGoodSweet was the daily feature in a piece titled, Sweet Talk. WASHINGTON POST, October 21, 2009 David Guas and DamGoodSweet were featured on the front page of the food section in, The Tough Guy with the Big Easy Touch. SAVEUR MAGAZINE, November 2009 DamGoodSweet is featured as one of three new cookbooks that make baking more fun than ever, taking readers on a culinary journey through the rich landscape of Southern culture. RESTAURANT BUSINESS, October 1, 2009 David Guas is selected and featured as a judge in a panel of industry pros for the Restaurant Business Clean Plate Awards. FOOD & WINE MAGAZINE, October 2009DamGoodSweet is featured as one of three New Best Dessert Cookbooks for 2009. GARDEN & GUN, September 2009 Talk of the South Newsletter selected DamGoodSweet as one of four, Southern flavor Best Upcoming Cookbook Releases of the year. THE NEW YORK TIMES, July 8, 2009 David Guas and his recipe for Strawberries with Brown Butter Shortcake from DamGoodSweet were featured in In From the Rain, a Mixed Harvest. 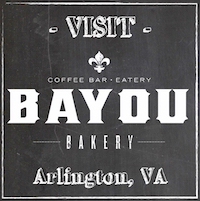 WASHINGTON POST, April 8, 2009 David Guas featured in Bayou Bakery announcement. WASHINGTON POST, November 30, 2008 David Guas featured in hunting article Up Before Breakfast, Learning to bag a Sustainable Dinner including recipes for Holiday Goose and Sweet Potato Hash with Cranberries and Red Wine. REDBOOK MAGAZINE, November 2008 David Guas was the featured chef in the New Orleans Thanksgiving dessert story with his two sons including recipes -- Heavenly Hash Bread Pudding, Sweet Potato Tarte Tatin and Apple Pie with Salted Pecan Crumble. DC MODERN LUXURY, 2008 David Guas selected as one of three hot chefs to watch in Washington, DC. FLAVOR & THE MENU, 2008 David Guas included in a dessert feature about the savory side of the kitchen in Top 10 Trends 2008, Top Dessert Trend, Sweets: Salty, Spicy & Savory. CHOCOLATIER, Summer 2007 Showcase column featured David Guas's Flan Tradicional with Almond Pastry and Cajeta Cream. HEALTH, June 2007 David Guas's Nutty Popcorn Bars featured. PASTRY ART & DESIGN, December 2006 David Guas featured in Signature column. ESQUIRE, November 2006 John Mariani named Acadiana one of the best new restaurants of 2006 and featured David Guas's decadents desserts: The Warm White Chocolate Bread Pudding with Salted Macadamia-Nut Ice Cream and Butter-rum Sauce tastes as if it's about ten thousand calories per spoonful and worth it. THE WASHINGTON POST, May 2006 David Guas's Lemon Doberge Cake with Lemon Fondant, Honey Poached Kumquats & Buttermilk Panna Cotta featured as Worth the Trip. WHERE WASHINGTON, March 2006 David Guas's Warm Canela-Dusted Churros with Mexican Chocolate Shooters featured. SOUTHERN LIVING, March 2006 Two-page feature on David Guas's desserts at Ceiba including Vanilla Bean Cheesecake with Guava Topping and Mango-Lime Salad. REDBOOK, March 2006 David Guas's mouthwatering desserts featured including Pecan Tart with Chocolate Bourbon Ice Cream and Salted Caramel Sauce, Warm White Chocolate Bread Pudding with Brown Butter Rum Sauce, and Praline Creme Brulee. DC MODERN LUXURY, November/December 2005David Guas's sorbets receive high praise, and Amanda McClements writes, The Lemon Doberge Cake [at Acadiana], a New Orleans classic, could easily star on a Martha Stewart magazine cover. DC MODERN LUXURY, September/October 2005 David Guas's Warm Canela-Dusted Churros with Mexican Chocolate Shooters are deemed pure pleasure. HOT CHOCOLATE, 2005 David Guas's recipe for Warm Canela-Dusted Churros with Mexican Chocolate Shooters included in book by Michael Turback. CHOCOLATIER, October 2004 David Guas's Spiced Apple Nut Cake is not to be missed. COTTAGE LIVING, September/October 2004 Extensive feature on David Guas entertaining at home, includes recipes. DIVERSION, September 2004 At Ceiba, desserts like Warm Canela-Dusted Churros to dip in thick hot chocolate are among the showstoppers. BON APPETIT, September 2004 David Guas's Sweet Potato Tarte Tatin featured. CONDE NAST TRAVELER, May 2004 Talented David Guas's featured in Hot Tables issue. WASHINGTON FLYER March/April 2004 You'll adore David Guas [sic] Warm Canela-Dusted Churros (accompanied by Mexican hot chocolate shooters) and Flan Tradicional (sugar, eggs and cream) shine in all their natural purity. WASHINGTONIAN, January 2004 Of his desserts at DC Coast: Guas's Buttermilk Beignets with Cafe au Lait Creme Brulle is a delicious take an [sic] a traditional New Orleans treat. THE WASHINGTON POST, December 2003 David Guas's Calabaza Fritters featured in The Sunday Source. THE WASHINGTON POST, December 2003 Restaurant critic Tom Sietsema writes, I have yet to find a single dessert I can say no to. THE WASHINGTON POST, 2003 Dining Guide Tom Sietsema wrote, the silken flan, treated to a drift of caramel cream, tastes like comfort food gone to finishing school. BON APPETIT, September 2003 David Guas featured as one of the decade's Dessert Stars; his Vanilla Bean Cheesecake with Guava Topping and Mango-Lime Salad is featured on cover. Why he's a star: for the versatility and cunning in his approach to comfort desserts jumping far, but always sticking the landing. FOOD & WINE, November 2002 David Guas's irresistible Sticky Toffee Pudding featured. NATION'S RESTAURANT NEWS, November 2001 David Guas featured in Culinary Currents column. CHOCOLATIER, November 2001 David Guas's Cafe au Lait Creme Brulle with Buttermilk Beignets featured. SANTÉ, Sept/Oct 2001 David Guas's Asian-inspired chocolates served on a dramatic teak tea wheel at TenPenh featured. FOOD ARTS, November 2000 David Guas contributes an article about his research trip to Indonesia, developing the dessert menu for TenPenh. WASHINGTON CITY PAPER, October 2000 David Guas handles the pressure of following a tough act with steely confidence.